Farming is a form of natural resource extraction and when farmers neglect to steward their land depletion occurs and eventually they can no longer farm that land. But this risk seldom occurs unless there are economic and political pressures placed on farmers. Often the state demands a constant increase in agriculture outputs, which eventually has contrary results as outputs decline because of soil depletion. For early Romans agricultural output slowly declined and population increased, per-capita energy availability dropped. The Romans solved this problem in the short term by conquering their neighbours to appropriate their energy surpluses (metals, grain, slaves, etc.). However, this solution merely exacerbated the issue over the long term; as the Empire grew, the cost of maintaining communications, garrisons, civil government, etc., increased. Eventually, this cost grew so great that any new challenges such as invasions and crop failures could not be solved by the acquisition of more territory. At that point, the Empire fragmented into smaller units. We should remind ourselves that the coming apart of a society is not dramatic, it unravels very slowly and largely without notice, great civilizations have fallen because they failed to prevent the degradation of the soils on which they were founded. Our world today could suffer the same fate. This is according to Professor Mary Scholes and Dr Bob Scholes who have published a paper in the journal, Science, which describes how the productivity of many lands has been dramatically reduced as a result of soil erosion, accumulation of salinity, and nutrient depletion. "Cultivating soil continuously for too long destroys the bacteria which convert the organic matter into nutrients," says Mary Scholes, who is a Professor in the School of Animal, Plant and Environmental Sciences at Wits University. Although improved technology -- including the unsustainably high use of fertilizers, irrigation, and ploughing -- provides a false sense of security, about 1% of global land area is degraded every year. In Africa, where much of the future growth in agriculture must take place, erosion has reduced yields by 8% and nutrient depletion is widespread. "Soil fertility is both a biophysical property and a social property -- it is a social property because humankind depends heavily on it for food production," says Bob Scholes, who is a systems ecologist at the Council for Scientific and Industrial Research. However, according to Scholes, it is not possible to feed the current and future world population with a dogmatically "organic" approach to global agriculture. Given the large additional area it would require, such an approach would also not avert climate change, spare biodiversity, or purify the rivers. Matthew Stephens is a permaculture designer based in Chicago and is the founder of the Earth Reforestation Project and Permaculture America. He believes that scientists who do not apply their science to the real world on an ongoing basis and have not attempted to replicate or implement solutions don't know much about what is possible or not possible. “When people with diverse skill sets, talents, and a combined understanding and mutual agreement to cooperate and collaborate with one another in small effective teams thay can achieve great things for the planet,” he said. “Small scale organic gardens will always be the sustainable solution to feeding the global human population with maximum efficiency, minimal energy inputs, and minimum waste,” said Stephens. Helen Browning is with the UK Soil Association and she wrote in “The Ecologist” that the need for farmers and growers to understand and protect soils has never been greater. “We are destroying soils worldwide ten times faster than nature can restore them, and in the last 40 years, human activity has degraded 2 billion hectares of soil -over 15% of our land”, said Browning. Browning suggests that only 15% of land globally is suitable for growing food and even in the UK, where temperate climate reduces erosion risk, it’s estimated that 2 million tonnes of soil are lost each year, valued at £150 to £250 million. And across Europe, we 250ha / day is lost to development. The above story is based on materials provided by Wits University. on which they were founded. Our world today could suffer the same fate. 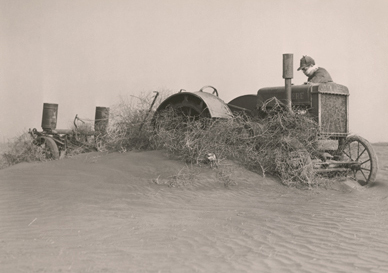 Soil erosion is fast becoming one of the worlds greatest problems. It is estimated that "more than a thousand million tonnes of southern Africa's soil are eroded every year. Experts predict that crop yields will be halved within thirty to fifty years if erosion continues at present rates." Soil erosion is not unique to Africa but is occurring worldwide. The phenomenon is being called Peak Soil as present large scale factory farming techniques are jeopardizing humanity's ability to grow food in the present and in the future. Without efforts to improve soil management practices, the availability of arable soil will become increasingly problematic. Given the finite supply of natural resources at any specific cost and location, agriculture that is inefficient or damaging to needed resources may eventually exhaust the available resources or the ability to afford and acquire them. It may also generate negative externality, such as pollution as well as financial and production costs. The way that crops are sold must be accounted for in the sustainability equation. Food sold locally does not require additional energy for transportation (including consumers). Food sold at a remote location, whether at a farmers' market or the supermarket, incurs a different set of energy cost for materials, labour, and transport.